Frankly, we'll call the track record of Japanese/Chinese anime production company Haoliners "mixed"- I liked To Be Hero but found its distaff "counterpart" To Be Heroine unwatchable; while Stig loathed Fox Spirit Matchmaker. But if those latter two were definitely "misses", this one (produced in association with CoMix Wave Films) isn't too bad- its three "slice of life" stories range from mediocre to pretty good. It starts with what I found the weakest one, "The Rice Noodles", which is all about, well, its hero's obsession with rice noodles (specifically, San Xian noodles), which triggers his own Remembrance of Things Past- or at least of Noodles Past. 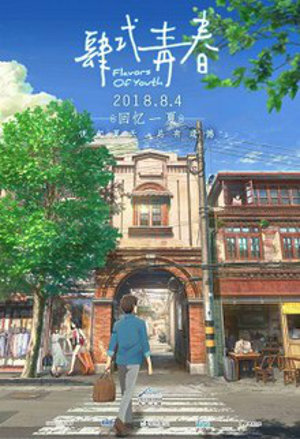 This one, like the other stories on the OVA, is set in China, the characters have Chinese names, and yet the spoken language (at least in the version I watched) was Japanese, which was a bit unsettling. Our hero, Xiao Ming, has a very noodle-centric view of the past, remembering mainly the noodles- whether they were wonderful, whether they were so-so, how fluffy the eggs were, etc.- though he DID notice things that were noodle-RELATED, for example things that were happening at the noodle shops (after all, they might have an impact on his noodle access), in particular at the second noodle shop he bought from- there were apparently things going on with the family who ran it, but our hero never inquired too deeply, because Xiao's interest in life never seemed to extend that much beyond his bowl, and he comes off as INCREDIBLY passive, avoiding any active involvement in life at all. He might notice a girl, but one gets the impression she'd have to bring him a well-seasoned bowl of noodles if she wanted his attention. Since they play this guy absolutely straight and sincere, I found this segment begging for an MST3K type of treatment. The second segment, "A Little Fashion Show", I liked MUCH better. Our protagonist here, Yi Lin, is a model who's acquired a formidable younger rival, a girl named Shui Jing, who wants to steal all Yi Lin's jobs from her- and much more besides. But Lin has a support team of her younger sister Lu Lu (who shares her apartment) and her manager "Steve", who will do what they can to help her. "Steve" is a bit of a gay stereotype, but he's very sensible, a loyal friend to Lin, and easily my favorite character in the whole show. The last segment is called "Love in Shanghai" and is, indeed, the only love story proper in this anthology. Our hero is one Li Mo, our heroine is named Xiao Yu, and it's got its share of clichés (e.g., hurt ankle leading to piggyback ride, etc.). Once again, we've got missed communications (some involving a now-antiquated method of transmission) leading to severe consequences for our pair of would-be lovers. Is this romance down for the count, or can it make a comeback? Recommended Audience: Mature situations, but nothing really objectionable. Netflix rates TV-PG.